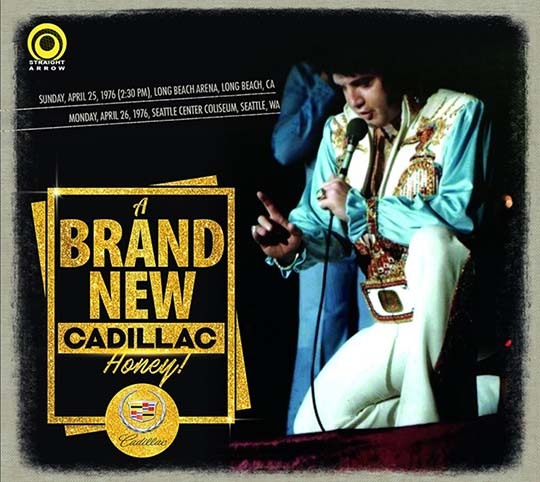 A BRAND NEW CADILLAC, HONEY! Un altro nuovo doppio cd firmato Straight Arrow è di prossima uscita. 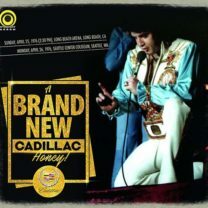 Si intitola “A Brand New Cadillac, Honey!” e contiene il concerto inedito del 25 aprile 1976 afternoon show alla Long Beach Arena di Long Beach in California e il concerto del 26 aprile 1976 allo Seattle Center Coliseum di Seattle a Washington (già edito in passato dalla Milbranch Records con il titolo “The Bicentennial King Vol. 2”). In questo tour Tony Brown e Ronnie Tutt vennero sostituiti da Shane Kiester al piano e da Larrie Londin alla batteria. Qualità audio amatoriale, ma sempre proveniente da una registrazione di prima generazione. Confezione digipack a 4 apnnelli con foto dello show del 25 aprile ’76. 01. Introduction: Also Sprach Zarathustra – 02. C. C. Rider – 03. I Got A Woman / Amen – 04. Love Me – 05. If You Love Me (Let Me Know) – 06. You Gave Me A Mountain – 07. All Shook Up – 08. (Let Me Be Your) Teddy Bear / Don’t Be Cruel – 09. Tryin’ To Get To You – 10. America (The Beautiful) – 11. Polk Salad Annie – 12. Introductions of singers, musicians, orchestra – 13. What’d I Say – 14. Drum Solo (Ronnie Tutt) – 15. Bass Solo (Blues – Jerry Scheff) – 16. Piano Solo (Tony Brown) – 17. Electric Piano Solo (David Briggs) – 18. School Day – 19. Hurt – 20. And I Love You So – 21. Burning Love – 22. How Great Thou Art – 23. Hound Dog – 24. Funny How Time Slips Away – 25. It’s Now Or Never – 26. Can’t Help Falling In Love – 27. Closing Vamp. 01. Introduction: Also Sprach Zarathustra – 02. C. C. Rider – 03. I Got A Woman / Amen – 04. Love Me – 05. If You Love Me (Let Me Know) – 06. You Gave Me A Mountain – 07. All Shook Up – 08. (Let Me Be Your) Teddy Bear / Don’t Be Cruel – 09. Tryin’ To Get To You – 10. My Way – 11. Polk Salad Annie – 12. Monologue about New Year’s Eve show in Pontiac / Auld Lang Syne (one line) – 13. Introductions of singers, musicians, orchestra – 14. What’d I Say – 15. Drum Solo (Ronnie Tutt) – 16. Bass Solo (Blues – Jerry Scheff) – 17. Piano Solo (Tony Brown) – 18. Electric Piano Solo (David Briggs) – 19. School Day – 20. America (The Beautiful) – 21. And I Love You So – 22. Hound Dog (with break) – 23. Hurt – 24. Help Me – 25. How Great Thou Art – 26. Blue Suede Shoes – 27. Funny How Time Slips Away – 28. Can’t Help Falling In Love – 29. Closing Vamp.